Isaiah 7:17 Disaster for Judah. Isa 7:17 “The LORD will bring on you, your people, and your ancestor’s family a time unlike any since Ephraim broke away from Judah. He will bring the king of Assyria. Notes : After assuring Ahaz about the invasion of Israel and Syria against Judah then the LORD warns him that he would be endangered from another direction. at a time like any since Ephraim broke away from Judah. That is, the separation of the 10 tribes from Judah and Benjamin. 2Ch 28:1 Ahaz was 20 years old when he began to rule. He ruled for 26 years in Jerusalem. He didn’t do what the LORD considered right, as his ancestor David had done. 2Ch 28:2 He followed the example of the kings of Israel and even made metal idols for worshipping other gods-the Baals. 2Ch 28:3 He burned sacrifices in the valley of Ben Hinnom and sacrificed his son by burning him alive, one of the disgusting things done by the nations that the LORD had forced out of the Israelites’ way. 2Ch 28:4 He offered sacrifices and burned incense as an offering at the illegal worship sites, which were on hills and under every large tree. 2Ch 28:5 So the LORD his God handed him over to the king of Aram, who defeated him, captured many prisoners, and brought them to Damascus. He also handed him over to the king of Israel, who decisively defeated him. Pekah took 200,00 captive. He proposed to take them to Samaria the Capital of Ephraim but was prevented by the prophet Oded. They fed and clothed them then returned them to Jericho and they left. God knows how to punish a wicked nation in His own way. – All Nations are under His control. Satanic Idolatry of Molech. The Killing of Babies. Isa 7:14 So the Lord himself will give you this sign: A virgin will become pregnant and give birth to a son, and she will name him Immanuel [God Is With Us]. Isa 7:15 He will eat cheese and honey until he knows how to reject evil and choose good. Notes : Curds and Honey or cheese and honey. (chemah Heb. ) = curdled milk, cheese or butter. Jewish Tradition and Physicians believed that the best food for a child was raw honey, then milk. until he knows how to reject evil and choose good. About three years of age moral consciousness begins, or the age of moral discrimination. Deut. 1:39 Although you thought the little children would be captured in war, your children, who are still too young to know the difference between good and evil, will enter that land. I will give it to them, and they will take possession of it. the land of the two kings who terrify you or the land you dread(abhor and loathe) which causes so much alarm. Those two kings were so alligned in such a close alliance they counted their lans as one. These people within twelve years Damascus was captured by Assyria in 732 BC and Israel had already fallen in 722 BC. Their lands would be laid waste. Photo of Damascus Syria today. Isaiah 7:10-14 An Appearance of Piety but really rebellious. Isa 7:13 “Listen now, descendants of David,” Isaiah said. “Isn’t it enough that you try the patience of mortals? Must you also try the patience of my God? As for a sign convincing to yourself since you do not fully believe the words of the Prophet Isaiah. Since Ahaz disbelieved God proposes to him that he ask for proof or a demonstration that would put the words of the Prophet beyond doubt. A SIGN = A miraculous demonstration that shall confirm the Promise that had been made to him. sign Heb. (owt) or (oth) = which was a flag or standard. Cp. Num 2:2 “The Israelites will put up their tents with each family under the flag that symbolizes its household. They will put their tents around the tent of meeting, facing it. Gen 17:11 All of you must be circumcised. That will be the sign of the promise from me to you. So circumcision was the Sign or Pledge token or Proof of the Covenant God made with the Israelites. Jdg 6:17 Gideon said to him, “If you find me acceptable, give me a sign that it is really you speaking to me. It was a miracle performed in attestation of Divine Promise or Message. Some people do not want a demonstration of God’s Divine faithfulness to His promise. No matter what they will not be convinced. In other words he is saying, “We are the people who are depending on our own devices and resources. We are unwilling to seek the aid from the God of Israel and Judah, Jehovah. Notes. “Listen now, Descendants of David. These were the King and Princes who had descended from the King David. But David had confided in God but here is Ahaz afraid of tempting God. It is as if He would not help him anyway. (Barnes Notes). You are not satisfied with only wearing out the people but you would wear out the Patience of God as well. Must you also try the patience of my God? Will you refuse to keep His commands and try His patience ? Isa 1:14 I hate your New Moon Festivals and your appointed festivals. They’ve become a burden to me, and I’m tired of putting up with them. Isa 1:15 So when you stretch out your hands in prayer, I will turn my eyes away from you. Even though you offer many prayers, I will not listen because your hands are covered with blood. Ahaz, by His unbelief and idolatry greatly tried the patience of God and all the devout people in the land. Here is a great affront directed at God Himself. God will give you proof that the Land will be safe even though, you, a proud and Irreverent Monarch of Israel refuses to seek God’s Promise and His Confirmation. Answer: Reverence is honour and respect that is deeply felt and outwardly demonstrated. Because of the Lord God’s awesome power and majesty, He is deserving of the highest level of reverence (Leviticus 19:30). The Bible records reverence as the automatic response of everyone who encounters the awesome grandeur of the Lord God Almighty (Numbers 20:6; Judges 13:20; 1 Chronicles 21:16). Isaiah 7: 5-9 Stand firm in Faith in your trials. Isa 7:7 This is what the Almighty LORD says: It won’t take place; it won’t happen. Isa 7:8 The capital of Aram is Damascus, and the leader of Damascus is Rezin. Ephraim will be shattered within 65 years so that it will no longer be a nation. Isa 7:9 The capital of Ephraim is Samaria, and the leader of Samaria is Remaliah’s son. If you don’t remain faithful, you won’t remain standing. Notes: 7:5-6 These two Aram and Ephraim were planning to destroy Judah by breaching the wall around Jerusalem and levelling the city. They wanted to destroy the Davidic Dynasty and put the unknown Prince Tabeel on the Throne of Judah. It is the Lord, Himself who decides to put one down and lift another up. God raises up whoever He wants. How amazing is that? Notes on Verse 8. For the head of Aram is Damascus and the head of Damascus is only Rezin. Within 65 years Ephriam will be too shattered to be a people. In Isaiah 17:1 we see that Damascus will be destroyed. Isa 17:1 This is the divine revelation about Damascus. “Damascus will no longer be a city. It will become a pile of rubble. Isa 17:2 The cities of Aroer will be deserted. These cities will be used for sheep, which will lie down in them. There will be no one to disturb those sheep. Isa 17:3 Fortified cities will disappear from Ephraim, and the kingdom will disappear from Damascus. Application: What fantastic foreknowledge God has. Why can’t we see into the future for Australia. Perhaps we are too proud. We are not low enough in our own estimations and seeking God in Prayer and fasting. I would Like someone to Prophesy the results of this election that is coming up in May 2019. Notes on Verse 9 : If you do not stand firm in your faith you will not stand at all. Ahaz was greatly alarmed by what he had heard. But here we have Isaiah encouraging him. He told him that if he did not trust in the Promise of God he would not stand at all nor be protected. You will only be secure and protected if your faith and trust is in the Lord to care for you. Isa 7:3 Then Jehovah said to Isaiah, Go out now to meet Ahaz, you and Shear-jashub your son, at the end of the conduit of the upper pool in the highway of the Fuller’s Field. Isa 22:9 You have seen also the breaks in the city of David, that they are many; and you gathered the waters of the lower pool. 2Ch 32:4 And there were gathered many people, who stopped all the fountains, and the torrent which ran through the midst of the land, saying, Why should the king of Assyria come and find much water? Ahaz was cutting the water supply to the enemy. Shear-Jashub means (A remnant shall return) cp. 6:3 Here was this son of Isaiah who by his name was a living Memorial that the nation would not be completely destroyed despite the calamity that had come upon it. Isa 10:20 And it shall be in that day, the remnant of Israel, and those who have escaped from the house of Jacob, shall never again lean on him who struck them; but truly lean on Jehovah, the Holy One of Israel. Isa 10:21 The remnant shall return, the remnant of Jacob, to the mighty God. Isa 10:22 For though Your people Israel are like the sand of the sea, yet a remnant of them shall return; the full end which is decreed shall overflow with righteousness. Isaiah and Shear Jashub together (meeting the King),were as it were a Blessing and a Cursing. This was at once a Threat and a Promise. This was all designed to drive King Ahaz to Jehovah by force. The son’s name spoke of devastation and return of a remnant while “Isaiah’s” Name spoke of Jehovah as their Salvation. This had a promising tone. When an enemy is coming against you the first thing that happens is fear and confusion grips you. Now the Word of the LORD through Isaiah was to be calm, strong and fearless. Gen 15:1 After these things the Word of Jehovah came to Abram in a vision, saying, Fear not, Abram, I am your shield and your exceeding great reward. Gen 26:24 And Jehovah appeared to him the same night, and said, I am the God of Abraham your father. Do not fear, for I am with you, and will bless you and multiply your seed for My servant Abraham’s sake. Exo 14:13 And Moses said to the people, Do not fear. Stand still and see the salvation of Jehovah, which He will prepare for you this day. For the Egyptians whom you have seen today, you shall never see them anymore. Just the ends were left burning. Just what remains of the firebrands were almost extinguished and incapable of doing much harm. Sometimes we give much more credit to the enemy than God gives. Listen to the Promises of the Word of God and not the concoctions of you ow imagination. Isa 7:1 And it happened in the days of Ahaz the son of Jotham, the son of Uzziah, king of Judah, Rezin the king of Syria, and Pekah the son of Remaliah, king of Israel, went up toward Jerusalem to war against it, but could not overcome it. Isa 7:2 And it was told the house of David, saying, Syria is allied with Ephraim. And his heart was moved, and the heart of his people, as the trees of the woods are moved (shaken) by the wind. About 738 BC (see 1 Kings 16:5 and 2 Chron. 28:5) apparently the Invasion occurred twice when Pekah, the King from Israel (10 Northern Tribes) and Rezin, the King of Aram (Syria) marched up to fight against the weakened Judah. But they could not prevail. The beseiged Ahaz in 2 Kings 16:5 but now they are threatened by Assyria. v.2. And it was told the house of David, saying, Syria is allied with Ephraim. And his heart was moved, and the heart of his people, as the trees of the woods are moved (shaken) by the wind. Notes : The House of David is the Royal House of the Kings descendants of David. Ephraim though a tribal name of one of the Ten Northern tribes also refers to the Kingdom of Israel in Samaria. Aram was in alliance with Ephraim and was probably set up in camp in Ephraim. And his heart was moved, and the heart of his people, as the trees of the woods are moved (shaken) by the wind. Not only was Ahaz’s knees knocking together but the whole population was scared by the bad news. They trembled with great consternation and alarm. Application how would you feel if an enemy came invading your land, killing and taking POWs. I guess that you would just be like the rest of us. In reality there will be an escalation of Conflicts and rumours as we approach the return of Christ. Mat 24:6 And you will hear of wars and rumours of wars. See that you are not troubled, for all these things must occur; but the end is not yet. Luk 21:9 But when you hear of wars and disturbances, do not be terrified, for all these things must first occur, but the end is not at once. iS. 9:11-13 How Long Must I Speak LORD? Isa 6:12 and until Jehovah has moved men far away, and the desolation in the midst of the land is great. Isa 6:13 But yet in it shall be a tenth, and it shall return and be consumed like the terebinth and like the oak being felled, yet has its stump; the holy seed is its stump. All the Cities are ruined and without inhabitants. 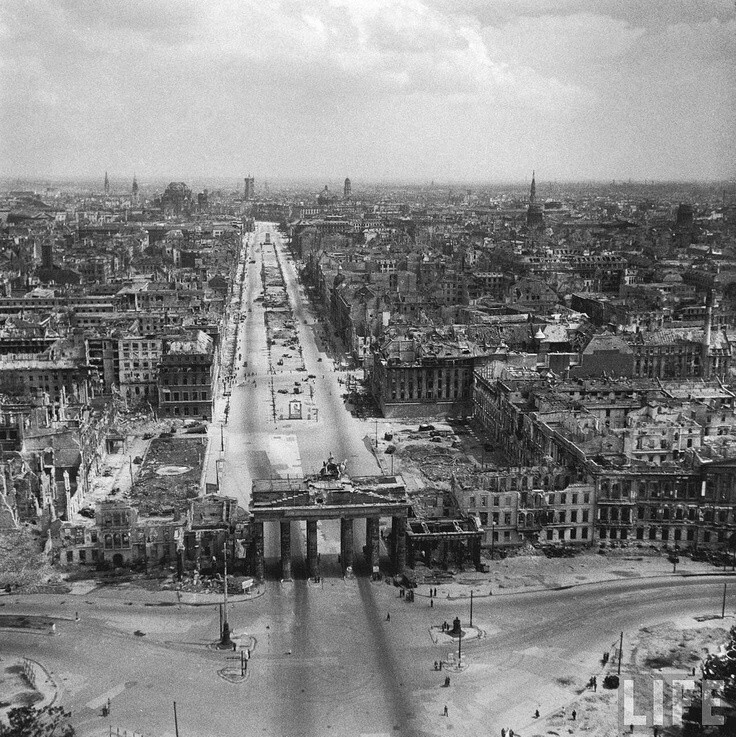 Like Berlin at the end of the WW2. 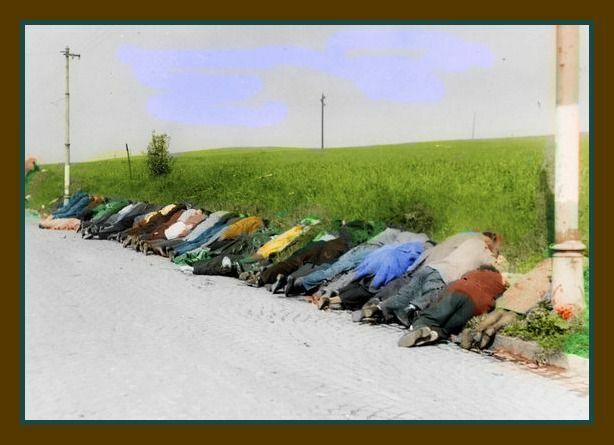 PinterestSudeten Germans shot by the Czechs in 1945. All ethnic Germans living in Czechoslovakia were either expelled or massacred after the end of WW2. Isa 6:12 and until THe LORD has moved men far away, and the desolation in the midst of the land is great. (in Israel). What does it take for people to listen and turn and be saved. The LORD moved the Ten Tribes of Northern Israel all the Way to Assyria where ISIS has been now operating near Mosul. How far did they have to walk as captives on empty stomachs, people dying of exhaustion every day. Isa 6:13 But yet in it, (Israel) , shall be a tenth, and it shall return and be consumed like the terebinth and like the oak being felled, yet has its stump; the holy seed is its stump. Notes :Even though only 1/10 remain in the land after all the others are marched off as captives to Assyria the remnant will be invaded again. What destruction. The Holy seed will be the stump in the land. God can make the Holy Seed to sprout again even everything looks like it is dead and finished. It is similar to what the LORD did in the resurrection of the Holy Line of David when Christ came born of Mary in Judah in Bethlehem the city of David. Sprouting of a dead Oak tree.